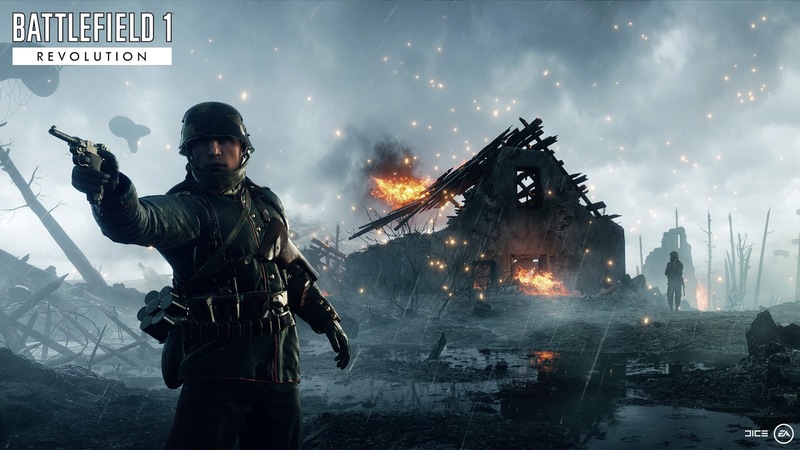 DICE, a studio of Electronic Arts Inc. (NASDAQ:EA) unveiled a Revolution for Battlefield™ 1. In the complete Battlefield 1 experience, Battlefield 1 Revolution allows players to experience the dawn of all-out war through epic multiplayer battles where no battle is ever the same, immersive single player War Stories, more maps, deeper progression and new modes, all in a single package. Battlefield 1 Revolution is now available worldwide for Xbox One, PlayStation 4 and Origin on PC. In addition, Battlefield 1 Incursions is a new intense gaming experience being developed in collaboration with players, and optimized for competition. Players can register now for the Closed Alpha beginning in September. Battlefield 1 Revolution is the quintessential way to join the Battlefield community and experience war on an unmatched scale. Battlefield 1 Revolution contains the Battlefield 1 base game and Battlefield 1 Premium Pass which includes four themed expansion packs*, each filled with all new maps, new modes and more, making it the complete Battlefield 1 experience. Players will have immediate access to Battlefield 1 They Shall Not Pass, featuring six maps including the game’s first night maps, Nivelle Nights and Prise de Tahure. Players can further expand the battle with Battlefield 1 Revolution in Battlefield 1 In the Name of the Tsar in September, partake in amphibious warfare in Battlefield 1 Turning Tides set to launch in December, and the most infamous battles of the Great War in Battlefield 1 Apocalypse, available in early 2018. Those who purchase Battlefield 1 Revolution will also receive the Red Baron Pack, Lawrence of Arabia Pack and Hellfighter Pack which contain themed weapons, vehicles and emblems based on the famous heroes and units. Also available now for those that own Battlefield 1 Revolution or Battlefield 1 Premium Pass is Lupkow Pass, the first map to be released from the upcoming expansion In the Name of the Tsar. In Lupkow Pass, players can battle it out in the snow-covered ravines and treacherous vertical drops of World War I. Then, when the full expansion releases in early September, players will further enter the war’s biggest front with the Russian Army and the Women’s Battalion of Death with five additional all new maps and two new Operations. In the Name of the Tsar also includes 11 new weapons, the new Ilya-Muromets Heavy Bomber vehicle, the Putilov-Garford Heavy Armored Car, the new Supply Drop game mode, new medals, dog tags, service stars and more, making it the most extensive update in Battlefield franchise history. In the Battlefield 1 Incursions Closed Alpha, players will be introduced to a tight, teamplay focused competitive experience in the game. Competitors will have to put their skills to the test in intense 5 vs. 5 matches, creating dramatic moments that include the signature Battlefield vehicle gameplay. Starting in September, players in the Closed Alpha will be able to choose from eight different kits (Trench Surgeon, Control Leader, AT Assault, Battle Mechanic, Mortar Support, Raid Leader, Shock Assault, Proximity Recon) on the modified Battlefield 1 Giant’s Shadow map, and rank up to gain access to improved weapons and abilities based on a combination of time and performance. The Battlefield 1 Incursions Closed Alpha is just the beginning of the team’s journey in crafting a long term-competitive experience in collaboration with the Battlefield community. The features, content, and systems of Battlefield 1 Incursions may change between Closed Alpha and its final, finished form. More details on the competitive gaming structure and events will be shared in the coming months. For more information on Battlefield 1, please visit www.battlefield.com or join the conversation on Facebook,YouTube, and Twitter ®.